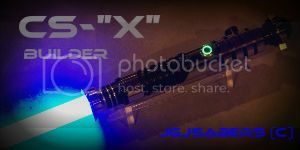 I just bought an MR 2005 Anakin ROTS saber and am strongly considering converting it, as I would very much like to have a duel-ready saber. However, I have a couple of possible issues. It looks like there might be a possibility of substituting a different piece of material for the portion which is usually cut from the original blade holder. If so, can someone tell me the length, diameters (inside and out) and any other information I would need trying to replicate it? With regards to the blade retention thumbscrew, can anyone thing of a way to keep the blade in without having to drill this hole? If not, does anyone have any ideas on where I could inexpensively have this done for me? If it helps matters, I live in the Northern Virginia (Washington, DC metro) area. Forgot to mention the second one. If I can make this saber purple, it will go a long way to getting the wife's support for spending the money on supplies and taking the time to do the project. I see that the kit page says that the MR board can drive a 3w Luxeon ... I have to admit that while I feel this should be obvious and I should know it already ... I am not 100% sure on whether you can drive a Tri-Rebel at 3w and therefore get a purple color here. So ... can I use a Tri-Rebel with this board / kit? You can use a Tri-Rebel or Cree with this, but it will not be as bright as it could be. The soundboards in these are only capable of outputting between 800 and 1200ma of current, and each die on the triple led's will want around 1000ma. It may still be better than the stock blade, though, so there's no harm in trying it.